10am on a chilly February morning in Snowdonia. 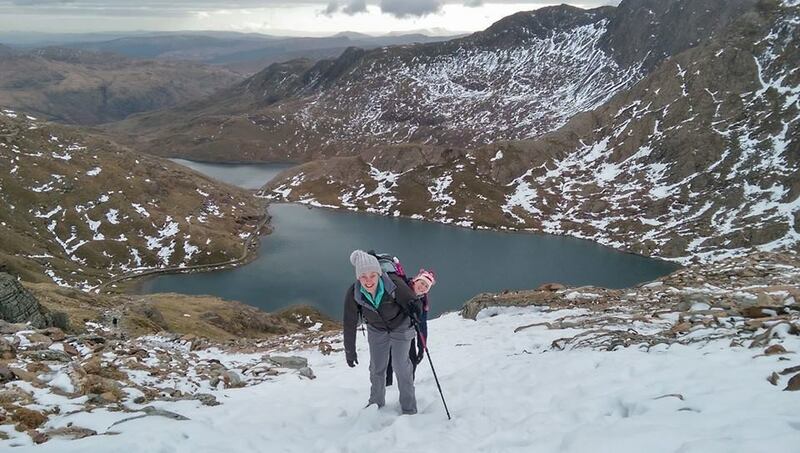 After walking for 2 and a half hours we made it to the snowy part of Snowdonia. I'd been quietly afraid for the last few days that my body would let me down, I'd be too breathless, too weak to get as high as I knew Sion wanted to walk. Looking up at him as we made it past the trickiest part of the pass I felt alive, strong, fit. Most of us are heavier than we were at 18, less able to get up and go like we used to. Joints start to complain, muscles become weary. But oh my, this body of mine is still strong, there is still fuel in the tank and fire in my belly. We didn't make it to the top this time - as the snow and ice got thicker we got a little more fearful. We will make it next time though, that I'm sure of. Stunning photo - and fabulous 'exercise' in such an amazing place. HIgh five to you and Snowdonia! Well done, such a fantastic achievement and a fantastic picture to show for it.